Hot on the heels of the enormously popular ARP-9 comes its big brother, the rather wonderful ARP-556. Although there are similarities within the ARP family, the 556 has some notable differences from its sibling. 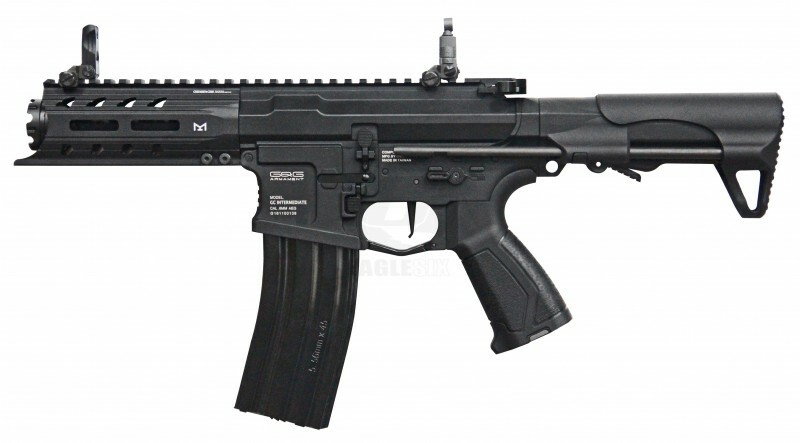 Whilst the 9mm version is from the Combat Machine range, the 556 features in the GC Intermediate line-up. The primary external difference is that this AEG has a full metal receiver similar to the modern 'billet' style. The fire selector and magazine release controls are ambidextrous and the selector switch clicks solidly into place. The trigger guard is hinged and can be popped open for players wearing gloves, although there is still plenty of space if you don't use this feature. The charging handle is rather stylish and when it is pulled back it releases the dust cover to reveal the hop adjust. The hop unit features a larger dial for easy adjustment and fine tuning. The rail travels the length of the receiver and handguard and has enough rail space for most attachments. The front and rear flip up sights both have horizontal adjustment for accurate target acquisition. The handguard really catches the eye with its unusual but brilliantly executed design. The finishing touch to the aggressive design is the amplifier that G&G call 'the crown'. If this isn't to your liking it can be easily swapped out for an alternative flash hider or a suppressor. The stock is primarily composed of durable polymer, but the excellent design makes it very stable and there isn't a hint of wobble that is normally found amongst crane stocks. The battery compartment can be found within the stock assembly, just slide the stock off of its runners, pop the cap and attach the battery. Easy! The version 2 gearbox is ridiculously crisp and the trigger response is outstanding thanks in part to the ETU & Mosfet. Compact, solid, loud & dangerous, all in one perfect package. We love it, and we're sure that you will too.